Implants that electrically stimulate nerves continuously to treat disease can cause off-target effects and pain. An implant that uses light to modulate the activity of genetically modified nerve cells might offer a solution. Ellen T. Roche is at the Institute for Medical Engineering and Science, Massachusetts Institute of Technology, Massachusetts 02139, USA. Advances in bioelectronics have enabled progress1 in the use of implanted electronic devices for treating disease. In the clinic, such approaches to modulating nerve cells that control bladder function2 can treat a condition called overactive bladder, which is characterized by a frequent urgent need to urinate, sometimes with associated incontinence, and an abnormally high number of bladder-emptying episodes. The conventional approach taken for such nerve modulation is to apply continuous electrical stimulation; this does not affect only the relevant nerve cells, however, and can lead to pain and off-target effects3. Writing in Nature, Mickle et al.4 describe a potential way of tackling this problem — a miniature implanted device that can sense and control bladder function in rats. 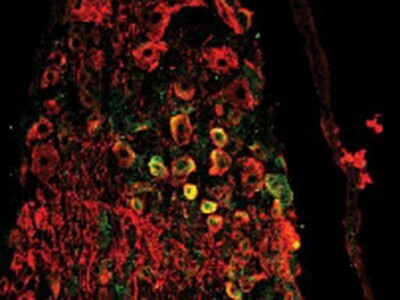 Rather than modulating nerve activity through the direct use of electrical stimuli, the authors harnessed an established technique called optogenetics, in which nerve cells in the bladder were genetically modified to express a light-sensitive receptor protein that can inhibit nerve-cell activation. Mickle and colleagues implanted a stretchable, high-precision strain sensor around each animal’s bladder that measured changes in bladder circumference over time. The bladder sensor was connected to light-emitting diodes (LEDs). These components were connected by wires to a flexible base-station device implanted in the abdomen. The base station was powered wirelessly by interactions with an element incorporated below the housing cage (Fig. 1). Figure 1 | An engineered system that alleviates bladder dysfunction. Mickle et al.4 have developed an approach that uses genetic engineering and an implanted device to generate a self-adjusting system (called a closed-loop system) that regulates nerve-cell activity to treat organ dysfunction in rats. The authors used animals that had been genetically engineered to express a light-sensitive protein in sensory nerve cells in their bladder. A stretchable sensor implanted in the bladder monitored the organ’s circumference, and it was attached to light-emitting diodes (LEDs). These bladder components were connected by wires to an implanted base-station electronic device in the abdomen that was powered wirelessly by a transmitter in the animal’s cage. The base station received information from the bladder’s stretch sensor and transmitted this wirelessly to an external user-interface device that tracked the bladder data. 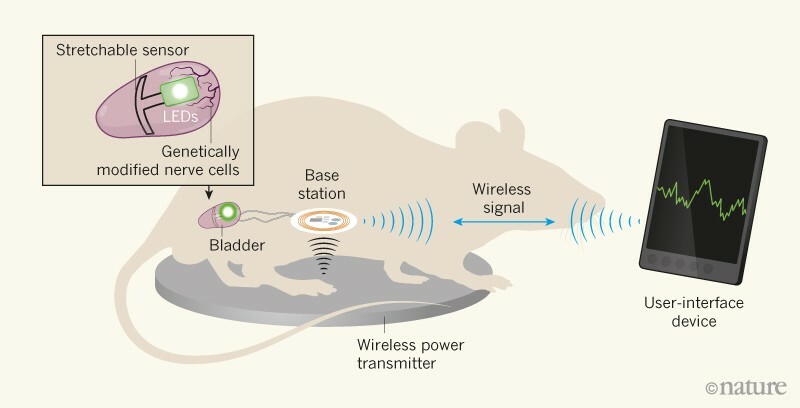 If the data indicated abnormally frequent bladder emptying, which happened when animals received the molecule cyclophosphamide (not shown), the external device transmitted a wireless signal back to the base station that caused the LEDs to turn on. Their illumination inhibited the genetically engineered nerve cells and consequently prevented an abnormally high frequency of urination. The bladder-stretch sensor communicated data to the base station, which then wirelessly transmitted this information to an external device that recorded and monitored bladder function. If the external device detected signs of abnormal bladder function — for example, unnecessarily frequent bladder emptying — it transmitted a signal wirelessly to the base station. This made the LEDs turn on, causing light-mediated inhibition of sensory neurons in the bladder that thereby affected the frequency of bladder emptying. This type of arrangement is called a closed-loop system, in which the output of the system — in this case, bladder size changes — is monitored and feeds back into the system as an input signal. This is advantageous in this context because it triggers the modulation of nerve-cell activity only when needed, providing a targeted, real-time control system. The authors tested how effective their system was for managing the bladder dysfunction that arises when rats are injected with the drug cyclophosphamide. This causes an inflammatory response and an increase in the number of episodes of bladder emptying compared with that in animals that do not receive cyclophosphamide. The authors’ system detected dysfunctional patterns of bladder emptying and consequently inhibited the organ’s sensory nerves and restored a normal pattern of urination frequency. Mickle and colleagues’ device is possible only because of many recently developed relevant tools. The authors needed implantable flexible sensors and stretchable electronics that can detect organ-dimension changes in a way that does not affect organ function5–8. Developments in the field of optogenetics, wireless data and energy transfer also provided crucial technologies needed for the system to function. The animal model of overactive bladder function that the authors chose for their system reveals the sophisticated capabilities of this technology. Whether this versatile platform could be adapted to treat other diseases should be explored. Mickle and colleagues’ work might have major implications for efforts to alleviate organ dysfunction and to modulate pain. However, it was not possible to determine whether the pain caused by bladder infection and the inflammation that can be associated with bladder dysfunction can be lessened by using the authors’ approach, and the effects of inhibition of sensory nerves using this method should be a topic for further investigation. It was previously shown9 that, for a surgically removed rabbit heart being kept functional in the laboratory, a stretchable, sleeve-like electronic device surrounding the heart can detect data such as temperature, pH and mechanical strain. If such a heart-monitoring device could be modified to incorporate the closed-loop control system developed by Mickle and colleagues, it might provide real-time feedback that could be used to modulate the activity of the implanted pumps or sleeves (called ventricular assist devices) that aid people who have a weakened heart10,11. Or, one day, a closed-loop system might be used to detect stretching of the stomach and relay this information to drive a feeling of fullness, as a way of managing obesity. Could this closed-loop system have the potential to be adapted into a medical device that enables normal bowel emptying for people with faecal incontinence caused by nerve damage? The approach developed by Mickle and colleagues has several key features. Using an optical system to modulate nerve-cell function provides greater stability and temporal precision than does electrical stimulation. Flexible electronics that conform to an organ surface offer a stable interface in which the electronic device matches the mechanical properties of the associated tissue. If it were possible to use input from physical cues such as changes in organ geometry, blood-flow dynamics or temperature in a closed-loop therapeutic device, this would open up a new way of thinking about how to harness biological sensing for clinical purposes. In contrast to current sensor techniques, which use cues such as chemical signals in blood-glucose monitors or electrical signals in heart pacemakers, focusing instead on easily measured physical cues might substantially increase the number of ways of assessing the function of an organ. This study provides a groundbreaking demonstration of how a fully closed-loop system can sense and control organ function, but there are some drawbacks. The wireless-powering mechanism requires a device that is placed underneath the animal’s cage, so alternative strategies would be needed to provide a wireless energy source for clinical use. Another disadvantage is that the optogenetics approach relies on the genetic modification of cells. In this case, a virus was used to introduce the engineered gene into bladder cells by injection into the bladder wall after a surgical incision through skin and muscle to expose the bladder. Moreover, this step was carried out some time before device implantation, and a requirement for repeated bouts of surgery could generate a barrier to the clinical implementation of this approach. Furthermore, if part of the system failed and needed to be replaced, additional invasive surgical procedures would be needed to remedy the problem. The body’s long-term response to the presence of a stretchable sensor around the bladder is unknown. It is also of concern that associated tissue damage might occur, such as the formation of excess fibrous connective tissue (fibrosis), or whether adhesions to surrounding tissue might arise that could limit implant function and have adverse effects on organ function. Mickle and colleagues have taken a major step forward for this field by developing a therapeutic system that enables specific and stable stimulation of the nervous system. If optogenetics approaches are approved for specific clinical applications, this type of closed-loop system might be poised to have a key role in driving a transformative shift towards the use of such strategies to treat human disease. Birmingham, K. et al. Nature Rev. Drug Discov. 13, 399–400 (2014). Siegel, S. W. et al. Urology 56 (Suppl. 1), 87–91 (2000). Kavvadias, T., Huebner, M., Brucker, S. Y. & Reisenauer, C. Arch. Gynecol. Obstet. 295, 951–957 (2017). Mickle, A. D. et al. Nature 565, 361–365 (2019). Krishnan, S. R. et al. Small 14, 1803192 (2018). Krishnan, S. R. et al. Sci. Transl. Med. 10, eaat8437 (2018). Chen, X. et al. Nature Commun. 9, 1690 (2018). Nan, K. et al. Sci. Adv. 4, eaau5849 (2018). Xu, L. et al. Nature Commun. 5, 3329 (2014). Gustaffson, F. & Rogers, J. G. Eur. J. Heart Failure 19, 595–602 (2017). Roche, E. T. et al. Sci. Transl. Med. 9, eaaf3925 (2017).